I want to move to Three Pines. After joining an amazing group of ladies to read the first Chief Inspector Gamache novel (Still Life) through Instagram and thoroughly enjoying both the book and chatting with my new friends, I decided to officially join up with the “Penny Pushers” and read all the books in the series with them, one month at a time. As soon as October began, I grabbed my copy of A Fatal Grace and started reading…and I didn’t stop until I had read the entire book that same day. Just like with Still Life, I became immersed in the tiny village of Three Pines, possibly even more so this time around. A Fatal Grace takes place during the Christmas holiday season and focuses on the murder of CC de Poitiers, a new resident of Three Pines. No one in Three Pines seems to like CC at all, and her abrasive attitude and disdain for her fellow villagers give them plenty of good cause. When she is murdered, nearly everyone becomes a suspect, and Chief Inspector Gamache returns to Three Pines to find out what happened while also trying to determine the identity of a homeless woman murdered in the city. There were many things about A Fatal Grace that I loved, a few that I wavered between loving and hating, and one in particular that I could have done without. I loved the return of the characters to whom I had grown attached in Still Life. There seems to be a core group of characters who will always feature in the Inspector Gamache novels, and I am more than okay with that. I adore Clara’s sweet nature, can’t get enough of Olivier and Gabri (especially Gabri’s back-and-forth with Ruth), and wish I could hang out by the fire at the bistro with all of them. I especially loved the humor in A Fatal Grace and felt that it had more moments that evoked chuckles from me than Still Life. 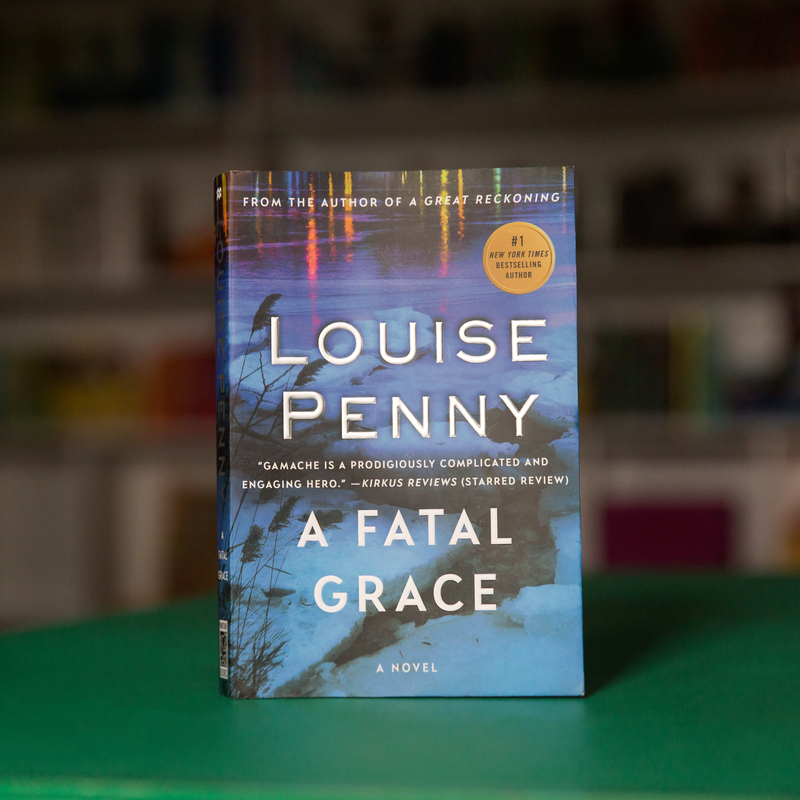 Louise Penny’s ability to weave humor throughout her mysteries is one of my favorite things about her writing, and I found A Fatal Grace to be a perfect mix. And, really, could Three Pines be any more perfect? I mean, aside from the fact that people keep getting killed there. There were a few elements of the book, however, that I kind of loved, but I also kind of hated. I kind of loved that the core characters remained safe, but I’m not sure that I love the fact that the book introduces new characters who are supposed to be key figures in Three Pines but were never mentioned in the first book. For me, this was a dead giveaway that one of those characters would be the responsible party or somehow involved. I know this enables readers to grow closer to the core group, and I would NEVER want one of them to be a murderer or closely involved with a murder, but this particular element definitely narrowed down the suspect list for me. I was still very surprised by the ending, however, and felt that Penny did an excellent job of making this particular case difficult to crack. I am also a bit unsure how I feel about all the drama behind-the-scenes with Inspector Armand Gamache. On one hand, I know that his particular storyline with the corruption at the force provides a link from book to book, but it also left me feeling like A Fatal Grace left a great deal unresolved, and I would prefer that the books focus on the crime committed instead. A Fatal Grace felt like there was WAY too much going on, especially once a few key details about the agents were revealed toward the end, and several times I found myself confused about the back story. However, this would keep readers from understanding Inspector Gamache as deeply, so I feel conflicted. Last, but not least, here’s what I kind of hated about A Fatal Grace…Agent Nichol. Correction…that’s what I REALLY hated. I can’t stand her character, and not in the way that I feel that she’s a valuable contribution to the plot, no matter how unlikable her character may be. I just wish she would go away. Forever. And the fact that (minor spoiler alert, again!) A Fatal Grace leads readers to believe that she’s going to be around for a while almost makes me not want to read the next book. Overall, I really enjoyed this book and am already looking forward to reading the next one…but if Louise Penny decided to have Agent Nichol get transferred to the other end of Canada between the second and third books, I would definitely be looking forward to reading it much more. Posted in FictionTagged A Fatal Grace, book blogger, book review, Chief Inspector Armand Gamache, Chief Inspector Gamache, fiction review, Louise Penny, Meet Me in Three Pines, Penny Pushers, Three PinesBookmark the permalink.